5 Day Ashram Retreat any date of your choice! This retreat is a personal retreat anytime throughout the year. It is a good introduction to Ashram activities. Personal Retreats are the most spacious way to spend time at the Ashram. During your stay, enjoy the benefits of yoga class, evening puja, japa, walking meditation as well as contribute to the ashram by doing daily Karma Yoga. The rest of the day is yours to reflect and renew. Ashram Munivara’s dorm style accommodation is open for guests & disciples from around the world. The retreat will include 4 nights accommodation in our student house share rooms. Room availability are based on gender. Our Ashram staff will orientate you on Day One with an Ashram Journey and give you an Ashram gift pack with 2 ashram sarongs as well as mala beads (prayer beads), Cd and Ashram T shirt. Guided morning Sadhana with an Ashram devotee include walking meditation and chanting. Morning Sadhana: Tuesdays & Friday / 7am until finish. Ashram puja is performed with sacred dance, chanting devotional songs to God & meditation. 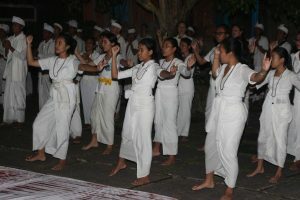 Puja is usually lead by the Guru of the Ashram with disciples every 5 days on the Balinese calendar day called “Kliwon”, Full Moon and New Moon days. Puja is open for everyone to join and you will be able to join at least one or more of our regular puja events depending on corresponding dates you choose for your retreat. Daily Breakfast will be served at Ojas Prana as well as 2 Dinners and 2 Lunches. 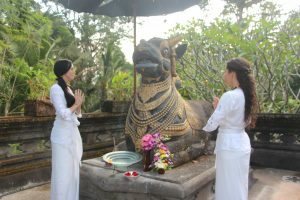 If you need treatment with the Guru please book through Ubud Bodyworks Centre. We do not manage Om Ham or Ubud bodyworks therefore please contact the venue directly. Please read the terms and conditions of Ashram stay. Must include Sunday as this day only is available for the Blessing Kundalini Tantra Yoga class held at Om Ham Retreat with the master and Guru of Ashram Munivara.